“El Local” is the community center and health clinic of the Batey Libertad community. Construction was completed in March of 2006 through the hard work and fundraising of Batey Libertad and two University of Vermont service-learning classes in 2005. 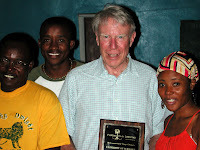 In March of 2007, the community celebrated the building’s one-year anniversary with a fiesta and thank you to UVM and the Lintilhac Foundation, a Vermont-based organization that has supported Batey Libertad projects over the last three years through donations, hosting fund-raisers, and supporting UVM’s annual Libertad speaker at the Burlington, Vermont campus (Photo: Phil Lintilhac accepting a thank you plaque from Papito, Tony, and Maritza). 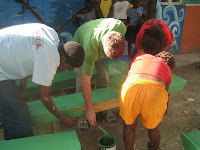 During a November 2007 UVM trip, students and community members rolled up their sleeves and built benches and tables, installed a solar photovoltaic lighting system, finished a volunteer apartment above the health clinic, and prepared newly acquired land behind El Local for a community farm. With consistent lighting in the evening, the community is hoping to establish a place for homework, tutoring, and adult literacy classes. The volunteer apartment is already being put to good use, with two UVM students staying on after a January class to help establish the community farm. March 2008 will bring the second anniversary of El Local and a UVM class to help formalize the Batey Libertad literacy program and finish the computer learning center.